I've owned several other portable grills (Grill-2-Go, $20 propane grills), but this one is by far the best. You know it is something special when it arrives fully assembled except for attaching the lid. The cast iron grilling surface makes those great searing marks and lets the food cook evenly. The regulator on this grill really allows you to adjust the size of the flame (unlike cheaper grills). The drip pan is also great and replacements can be purchased at local hardware stores. We use this grill with our RV and it is the perfect size for our family of 3. 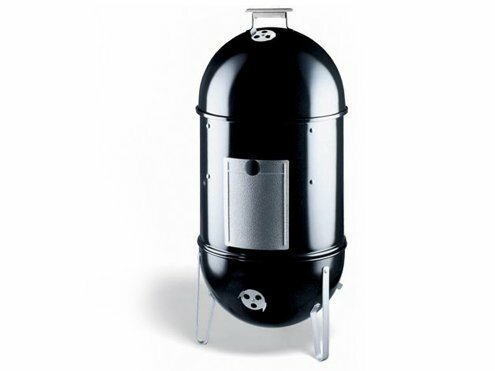 I don't see how we could use the full size Weber Q --- the baby Q is more than large enough for us. 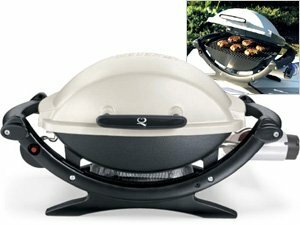 I was thinking about purchasing the Q Grill but was hesitant because of the size. Then I saw the Baby Q "new" this year! All I can say is that it's an amazing grill! Well crafted, very very portable and cooking with it is amazing! The food does not taste like propane whatsoever. And it makes perffffect grill marks!!! Just fantastic!!! The built-in starter is a good added bonus for this gas grill!! Also, the grill is bigger then what it looks like online. You can easily cook two chicken on this thing!! 10 out of 10. Cast iron grate and overall design delivers the best grilling I have ever enjoyed. I am all thumbs when it comes to grilling, but the BabyQ has never disappointed. Cannot recommend more highly. Cool Grill but ... What were they thinking! I like the grill a lot, but WHY IN THE WORLD would they make it to use a 14.1 OZ propane conister??!! I have YET to find one of those canisters, so I will have to take the other peoples advice and bend the support rind to accomodate the 16.4 oz conisters. POOR product development by Weber! Husband & I recently bought a Q, after many years of happy grilling on a Weber charcoal grill. We'd been shopping for a gas grill for quite some time, but could not find a quality small grill. Most of the gas grills are just TOO BIG! We're usually grilling just for the two of us and we wanted a gas grill for the convenience. The Q certainly fits the bill. It's great! I've cooked steaks, burgers, chicken, fish, pork chops, zucchini, onion slices -- well, you get the picture -- and they've all turned out perfectly. It gets plenty hot and heats very evenly. The side tables are a marvelous addition. I was concerned that they might get "icky" when you fold them into the Q, but they're designed so that only the tiny little points on the corners touch the grate. The cart is a worthwhile addition. It could be a bit sturdier, but it works well enough and the Q fits snugly on top of it and sort of "locks down" under some plastic tabs. I bought a 5' LP adapter hose for $10 at the local sporting goods store (look in the camp stove aisle) so I can hook it up to a 20# tank. My only complaint is that the cart instructions say DO NOT store a tank on the cart, so the tank has to sit beside the Q. I'd rather be able to store the tank on the bottom rack of the cart, but I guess Weber has its reasons for instructing you not to do so. All in all, a great purchase! The Q is a good looking, stylish grill. Added to that are clever design features (folding trays, ultra-light composite shell), a high quality regulator, and a cast iron cooking grate that weighs more than the rest of the grill. 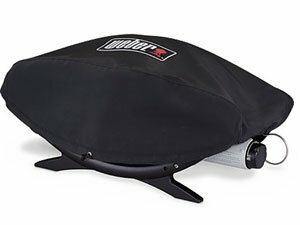 Weber has also designed accessories that add to the functionality of the Q. Out of the box, assembly is a breeze. A useful Owner's Guide and a nice recipe card booklet are provided. I've cooked one meal so far. The food cooked evenly across the whole surface. Once it was preheated, the medium gas setting was plenty to keep the heat up. I was very impressed with how well it cooked. Also, don't be fooled by the thought of a portable grill being small -- the Q can handle a lot of food. I had 4 sausages and 12 large shrimp on it and there was plenty of room for more. As a longtime dedicated charcoal guy, I find that gas grilling just doesn't provide the same flavor. But the Q has won me over for quick, clean, and convenient weeknight cooking. The idea of being able to take it on the road adds to the value. It may even prove to be a handy double-burner for weekend barbecues. Thanks, Weber, for another great grill. If it's possible for a grill to revolutionize BBQ'ing as mankind knows it, then this is the grill. Seriously! 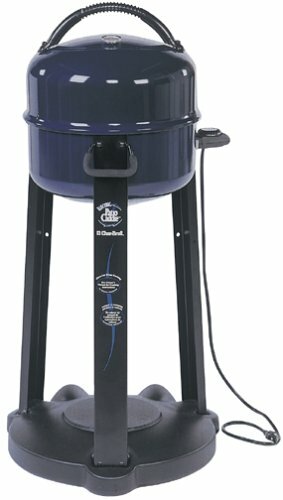 I was always a diehard charcoal BBQ guy, and I've had weber grills in the past and have been very happy with them. But I recently moved to an apartment complex where I could not have a charcoal grill. When I saw the Weber Q grill, it was love at first sight. The design is both attractive yet practical. The purchase was a no brainer as I new I had to have a gas grill, eve though I still would have rather had a charcoal one for the sheer flavor. Well after getting this home and cooking a dozen burgers and dogs for myself and some friends I was completely overwhelmed. I had never tasted gas-grilled burgers which tasted so good. Furthermore, this thing heats up so fast, it's just amazing. In 3 minutes the grill is hot and ready to go, and that grill, solid cast iron, holds the heat and cooks beautifully. I've never been able to cook those cool grill marks on burgers and steaks before. Believe me, you will cook perfect burgers and steaks, with those grill marks, while retaining all the flavor and juiciness. This grill is awesome. Unfortunately I paid $30 more than what Amazon is charging because I bought it from a specialty BBQ store and I needed it that day, but trust me, this is the best grill you will ever buy. I echo the positive sentiments of all reviewers past. Goes together quickly. I also have the stand & the cover. Just used the grill for a 4th of July mini-cookout. Perfect for the 2 of us. I can easily see this grill handling enough food for many more people without a problem. Came up to cooking-temperature very fast and cooked our steak tips and burgers nice and evenly. It was a very windy day here as well and I had no problem at all with the grill staying lit. Never once did I lose the flame. Very durable - I tipped it over while it was resting on the Weber Q cart. It rolled a few times on the lawn but was unscathed in the end. Not even a scratch. Needless to say I am very impressed with the quality of this product! Like some others mentioned, I am using the 16oz propane cylinders after a minor tweak to the holder. No problems there either. Even though we have more than enough room for a full-size grill, I like being able to store the grill in a small space. After using this one, I can see no reason to get a full-size grill. I would strongly recommend this grill. It truly lives up to all the hype. Living in a small top floor condo, I needed a grill that was small, yet worked well enough to cook a good family-sized meal. 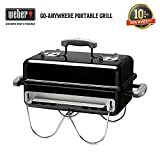 So after doing a little research on the internet, and by reading magazines; I settled on the Weber Q Portable Gas Grill. This grill is very nice for a portable grill. It's got an attractive functional design which allows it to fold up when transporting it, or when its not in use. Although it doesn't generate as much heat as bigger grills, it does have enough power to cook about 5-7 large hamgburgers at once easily. The burner is basically a rectangular metal tube with tiny holes from which the flames emerge from. The burner itself rests below the grill about 7-8inches. This makes a hotspot that is about center, but slightly towards the cover's hinges. Around the center of the grill, there is ample space for indirect cooking, but if you plan on cooking a large pork roast, this still maybe a bit small. Still, for most other things like hamburgers, chicken legs, ribs, and hot dogs; the Weber Q works very well. 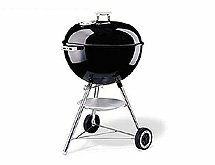 As far as taste goes, charcoal is still the best, but I would rather use a good gas grill like this one in favor of its easy clean up. The Weber Q's porcelain/cast iron grill can be easily removed and cleaned with soapy water and some good scrubbing. The drip pan is easily accessible as well as the bottom of the grill itself - where all the ash and drippings collect. This can be easily cleaned with some 409 cleaner and a scrubber. Typically it takes me about 15-20 minutes to clean my Weber Q after I finish using it. And best of all, I can do it all in my small kitchen, without having to go downstairs to the shared water hose. 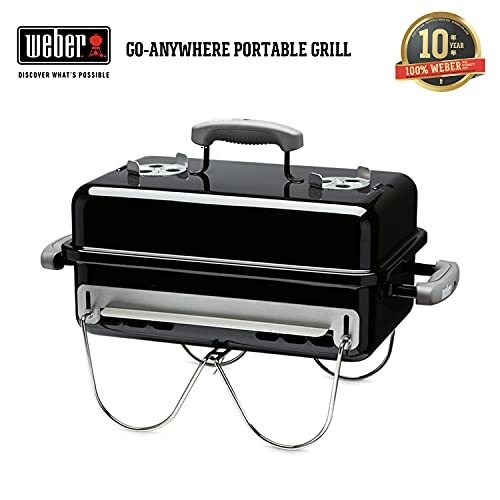 The Weber Q uses 14.1 ounce Propane gas canisters. These last about 1.5 hours, so I would recommend at least 3 for a weekend bar-b-que. These cansisters can be easily screwed into place, and held by a fitted metal ring. I should point out that the Weber Q is made to work with the 14.1 ounce canisters because this metal ring is sized for them specifically. You could also buy an attachment that allows for the larger, more common propane tank to connect to it, but I think that would cut down on its portability. Also note that these canisters should not be disposed of like other trash. Typically, hardware stores like Orchard Supply are willing to dispose of them for you. In my case, I usually give them my used canisters when I go there to buy more. great design, small size, unique product! OK, this grill doesn't get as hot as the much bigger, much more expensive weber-type grills with multiple burners. That said, it still easily gets hot enough to cook a decently thick new york steak in just a few minutes per side. And as far as cooking with the lid off-- what do you expect for a lousy [money amount]!?! On top of that, it's PERFECT for those with small apartment style balconies. It's economical on gas-- I use it pretty regularly and have yet to go through an entire large tank of propane in over six months of use. It's the perfect size if you're grilling a quick steak or two (or up to 6 or 7 hamburger patties) for one person. The grill itself has the large gratings that leave pleasant, savory grillmarks on the meat. It's easy to clean, and doesn't cling onto charcoal and carbon like other grills seem to. The lid also has thoughtful little hooks on the inside part of the assembly screws, making it easy to hang the lid on the lip of barbeque itself instead of having to set it down somewhere. The little temperature guage on the front is useful for telling how fast the inside grill temp is heating up (essential for preheating the grill, something you should always do before cooking), although I don't rely on its accuracy in cooking/timing meat. This is a great grill, a great idea, and great execution at a very attractive price. It's shown that it holds up extremely well after nine months of use, and I'd buy another in a heartbeat. Those with the space/backyards and multi-family sized barbeque needs should look elsewhere, but just looking at it should tell you that. For the rest of us doing some quick grilling for 1-2 people, this could be the perfect grill. I bought one of these grills three years ago to replace the standard aging $100 gas grill. It heats up quickly and cooks very nicely. The grill has wide flat porcelein bars instead of the thin chromed wires you would expect at this price. The lid has a thremometer built in, a nice touch. 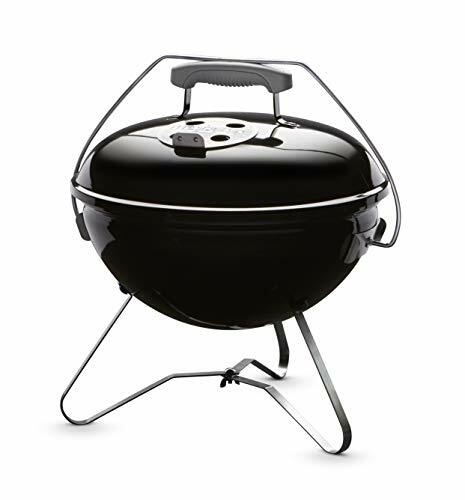 The grill is round, which doesn't leave hot and cold spots like some rectangular grill exhibit. The burner design is very simple, the top of the gas tube opens beneath a round cast heating plate which distributes heat very evenly. After three years, the grill shows no signs of aging. My ex-wife got the grill, so I just bought another one yesterday. The quality and great features are still there. This is a perfect grill for small groups. I typically only grill for my wife and I so the size is perfect. It wasn't too difficult to assemble and the parts machining is excellent, everything fit together very well. I have only 2 problems with this grill. First, the hangers you attach to the lid to allow you to hang the lid from the side of the grill are quite a pain when placing the lid. Makes it difficult for the lid to fit snugly. Not a problem, I'll just take the hangers off as they don't work that well anyway. Second, I grilled on it 2 days ago, on a fairly calm day weather wise. For some reason the flame kept going out. Took me an hour to grill 4 steaks, should have only taken 20 minutes. Not sure what causes this problem as I haven't ready anyone else experiencing it. It's annoying enough that it keeps the grill from getting 5 stars. we love the size of this grill.it is easy to keep clean.we are looking to buy another one and give our old one to our friends.the problem i found was the front leg rusted and broke away from the frame. Legendary Weber quality, tons of thoughtful features, and built-to-last construction make this propane-fueled gas grill a solid choice for years of pure grilling pleasure. Three high-grade stainless steel burners run the length of the durable, thick-walled cast aluminum cookbox, inputting a powerful 36,000 BTU per hour and producing exceptionally even heat without hot or cold spots. Each burner is individually controlled to enable either direct or indirect cooking, while the infinite control valves allow exceptionally precise temperature control. The Genesis Gold C also adds a heavy-duty side burner that lets you prepare your entire meal in one spot, heating side dishes and sauces while your meat grills. 611 inches of total cooking area provide enough room to cook for even large parties and include a convenient warming rack, to keep already-cooked foods warm or toast hamburger buns, and a warm-up basket, to cook easily burned foods like fish or vegetables and to provide more warming space. Weber's Crossover ignition system makes starting the grill easier than ever, lighting all three burners in succession with just the push of a button. Like all Weber gas grills, the Genesis Gold C features heavy-duty stainless steel Flavorizer bars to eliminate the flare-ups caused by lava rocks and ceramic briquettes; fats and juices hit the angled bars and sizzle away, adding delicious, smoky barbecue flavor instead of flames. A slide-out bottom tray funnels grease away from the burners and into a removable catch pan for quick and painless clean-up. 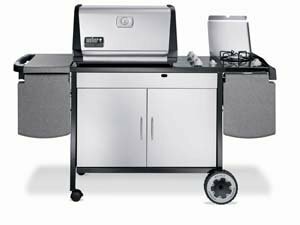 The grill includes a roomy storage area with solid steel bottom shelf, while a swing-up work surface offers plenty of space to spread out sauces, marinades, utensils and other prep essentials. The work surface is made from granite-look Thermoset for maximum durability, heat resistance, and ease of cleaning, and features four sturdy hooks to keep favorite barbecue tools close to hand. The double-walled stainless steel hood adds a layer of insulation to trap heat and protect from discoloring. Legendary Weber quality, tons of thoughtful features, and built-to-last construction make this propane-fueled gas grill a solid choice for years of pure grilling pleasure. Three high-grade stainless steel burners run the length of the durable, thick-walled cast-aluminum cookbox, inputting a powerful 36,000 BTU per hour and producing exceptionally even heat without hot or cold spots. Each burner is individually controlled to enable either direct or indirect cooking, while the infinite control valves allow exceptionally precise temperature control. 611 inches of total cooking area provide enough room to cook for even large parties and include a convenient warming rack, to keep already-cooked foods warm or toast hamburger buns, and a warm-up basket, to cook easily burned foods like fish or vegetables and to provide more warming space. Weber's Crossover ignition system makes starting the grill easier than ever, lighting all three burners in succession with just the push of a button. Like all Weber gas grills, the Genesis Gold B features heavy-duty stainless steel Flavorizer bars to eliminate the flare-ups caused by lava rocks and ceramic briquettes; fats and juices hit the angled bars and sizzle away, adding delicious, smoky barbecue flavor instead of flames. A slide-out bottom tray funnels grease away from the burners and into a removable catch pan for quick and painless clean-up. 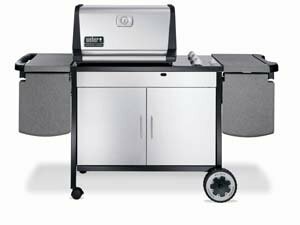 The grill includes a roomy storage area with solid steel bottom shelf, while two swing-up work surfaces offer plenty of space to spread out sauces, marinades, utensils and other prep essentials. 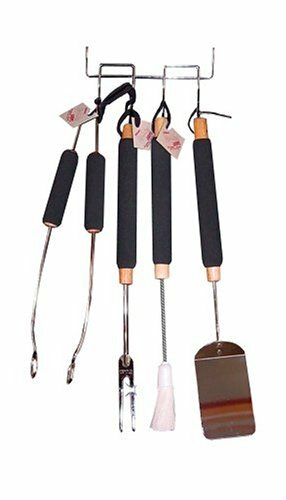 Both surfaces are made from granite-look Thermoset for maximum durability, heat resistance, and ease of cleaning, and they feature four sturdy hooks to keep favorite barbecue tools close to hand. The double-walled stainless steel hood adds a layer of insulation to trap heat and protect from discoloring. 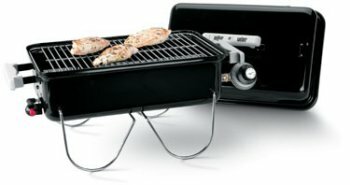 I live in an apartment, and was forced to buy an electric because no gas or charcoal grills are allowed. I picked this one, and I will say that I am very, very pleased with this grill. You still put charcoal briquets (included) into it, and it cooks VERY well, with no added tastes that you sometimes get from charcoal or gas grills. Top notch product, for a good price! I have had this grill for about a month now... I did a lot of research since I had to get an electric grill (by to my complex rules). This is a good grill. I cooks like a gas grill except you must keep it covered to cook. The food comes out great, the size is good... I recommend it to anyone with strict complex requirements, I may actually buy one for my father as well. We live in an apartment building that does not allow charcoal or gas grills, we decided to purchase this one. Many of our neighbors have it and the food always tastes great. We are in the process of putting ours together and I can tell you that the construction of the grill is extremely cheap... The screws that come with the grill to attach the accessories do not fit the brackets. So my husband ended up stripping the screws to fit them in. Overall this grill is very poor quality. I guess the old adage is true - they don't make things like they used to. This is the best small grill you can buy. Our priority was a small footprint, and that's what we got. It uses a minimal amount of space and produces the same delicious results as the most expensive large grill. I am a 50 year old woman who is pretty easily frustrated by mechanical devices, but found this easy to build. In fact, I built two of them one summer because my neighbor was so amazed at the quality and ease of use of this grill. The instructions were easy to read and follow. Amazon has an excellent price. I paid more for mine. Buy the plastic cover so you don't have to clean the outside of the grill, too. Great to use--the devil to put together! A wonderful product. It arrives unassembled and was a bear to put together--however we are not the handy types. The 800 helpline was soon on speed dial.